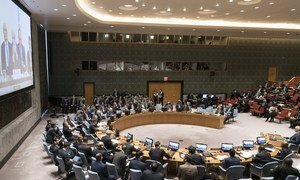 The first draft considered today – penned by the United States – which would have established a new investigative mechanism for one year, as well as identify those responsible for the use of chemical weapons, was rejected owing to a negative vote from Russia. A negative vote – or veto – from one of the Council's five permanent members – China, France, Russia, United Kingdom and the United States – blocks passage of a resolution. Today’s meeting marked the twelfth time Russia has used its veto to block Council action on Syria. This draft received six Council members’ votes in favour (Bolivia, China, Ethiopia, Equatorial Guinea, Kazakhstan and Russia), seven against (France, the Netherlands, Peru, Poland, Sweden, United Kingdom and United States) and two abstentions (Cote d’Ivoire and Kuwait). The recent escalating violence across Syria, including allegations of chemical weapons use in a Damascus suburb, could have consequences so devastating they are “difficult to even imagine,” a United Nations envoy warned Monday, calling for unity among global Powers to prevent a chain of events that could draw in actors far beyond the region.